More research is needed to better understand the pathophysiologic mechanisms that result in increased risk for infection among individuals with psoriasis. Infectious disease is a common comorbidity in patients with psoriasis, and rates of skin, respiratory, and abdominal infections are especially high in this population.1 Among individuals receiving treatment for moderate to severe psoriasis, infection has been identified as the second leading cause of death. Multiple studies have explored immunosuppressive therapies as a potential causative factor. A multicenter longitudinal study based on data from the Psoriasis Longitudinal Assessment and Registry examined the risk for serious infection in 11,466 adults receiving biologic or systemic therapies for psoriasis.2 Patients were followed for up to 8 years. The overall rate of infections was 1.45 per 100 patient-years (n=323), with varying rates across treatments: ustekinumab (0.83), etanercept (1.47), adalimumab (1.97), infliximab (2.49), non-methotrexate/nonbiologics (1.05), and methotrexate/nonbiologics (1.28). Pneumonia and cellulitis were the most common types of infections among registry participants, and the authors concluded that risk factors for increased infection included older age, smoking, diabetes, infection history, and exposure to infliximab and adalimumab. Another study of patients with psoriasis showed that the increase in infection risk was similar among those receiving etanercept, adalimumab, ustekinumab, and non-biologic systemic therapies.3 This suggests that the “risk [for] serious infection should not be a key discriminator for patients and clinicians when choosing between [these therapies] for the treatment of psoriasis,” wrote the authors. A recent cohort study used data from The Health Improvement Network to investigate the risk for serious infection, opportunistic infection, and herpes zoster among patients with (n=199,700) vs without psoriasis.5 According to the results, psoriasis was associated with a significantly increased risk for serious infection, with particularly high risk observed in patients with moderate to severe disease. This group also demonstrated an increased risk for opportunistic infection and herpes zoster that was linked with immunosuppressive therapy. To further explore infection risk in psoriasis, Dermatology Advisor spoke with Junko Takeshita, MD, PhD, MSCE, assistant professor of dermatology and epidemiology at the University of Pennsylvania Perelman School of Medicine in Philadelphia, and co-author of the 2018 study5 that used data from The Health Improvement Network, and Marius Rademaker, MD, honorary associate professor at Waikato Clinical Campus at the University of Auckland in New Zealand, and co-author of a 2018 review6 on the topic. Dermatology Advisor: What is known about the risk for infection in patients with psoriasis, including potential underlying mechanisms? Dr Rademaker: We have known for a long time that certain infections can trigger psoriasis in those genetically prone. The mechanism has been thought to be due to stimulation of the immune response by bacterial superantigen, although we are now becoming aware of differences in the microbiome of patients with psoriasis vs those without psoriasis. Streptococcal infection has been associated with guttate psoriasis, and Malassezia colonization with scalp psoriasis. 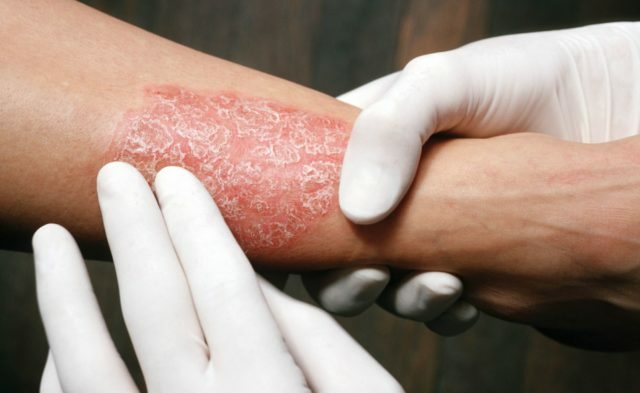 However, the routine screening for infection and treatment with antibiotics to prevent flares of psoriasis is not supported by the literature. Dermatology Advisor: Dr Takeshita, what do your recent findings add to our understating of infection risk in psoriasis? Dr Takeshita: Most existing studies on infection risk in patients with psoriasis have focused on understanding risk related to immunosuppressive therapies, especially biologics, used to treat moderate to severe psoriasis. Few studies have evaluated the risk for infection related to psoriasis itself. Our study adds to the scant existing literature on this topic by confirming that psoriasis is associated with an approximately 20% increased risk for serious infection, independent of traditional risk factors for infection that are captured in the medical record. The risk for serious infection was highest among those with moderate to severe psoriasis (~30% increased risk), and infections of the upper and lower respiratory tract and skin/soft tissue were among the most common infections observed. Compared with prior studies, strengths of our study include its larger size, inclusion of information about factors that affect infection risk such body mass index, smoking and drinking status, and vaccination history, and access to information on body surface area involved by psoriasis as a direct measure of psoriasis severity in a subgroup of our larger study population. Our study also evaluated the risks for opportunistic infection and herpes zoster associated with psoriasis and found increased risks for these infections to be primarily associated with moderate to severe psoriasis and almost entirely related to receipt of immunosuppressive treatment for psoriasis. Little is known regarding the underlying mechanisms that may contribute to increased infection risk among patients with psoriasis outside of the setting of immunosuppressive treatments for psoriasis. There are some data suggesting that certain cytokines that are known to be elevated in psoriasis — such as tumor necrosis factor — also contribute to the initiation of pneumonia and have been found, in certain populations, to be associated with a higher risk for pneumonia requiring hospitalization. More research is needed to better understand the pathophysiologic mechanisms that result in increased risk for infection among individuals with psoriasis. Dermatology Advisor: What are some of the risk factors for infection in this population, both on the patient level and related to psoriasis therapies? Dr Rademaker: From some good cohort studies, we know that severity of psoriasis, independent of systemic therapy, increases the risk for serious infection by 40% to 50% (HR 1.4-1.5).6 It is likely that patients with more severe psoriasis have greater comorbidities that independently increase the risk for infections; these include obesity, diabetes, metabolic syndrome, and particularly smoking, as the big increase in infections was in respiratory infections. One of our ongoing concerns with both traditional and the newer monoclonal and small molecule systemic therapies for psoriasis is the potential for serious infection. It has been difficult to tease out the confounders of the other risk factors for infection noted above. Some of the larger biologic registries have shown higher rates of serious infections in patients on biologic therapies, with some variation between anti-tumor necrosis factors and the newer monoclonals, but this possibly reflects that the anti-tumor necrosis factors were used in more severe chronic disease, with consequent greater confounding risk factors. The more recent studies don’t seem to show the same increase in serious infections. Dr Takeshita: While our study did not specifically focus on infection risk related to psoriasis therapies, we did find that patients receiving immunosuppressive treatments for psoriasis were generally at higher risk for serious infections, opportunistic infections, and herpes zoster. For opportunistic infections and herpes zoster, the risk seemed to be almost entirely related to immunosuppressive psoriasis treatment. Other risk factors for infection that we identified in our study population were expected risk factors, including comorbid conditions such as obesity and diabetes, which are more common in patients with psoriasis than in the general population, and recent systemic corticosteroid use, among others. Dermatology Advisor: How can clinicians help to prevent infection in these patients, and what are other relevant treatment implications or takeaways for clinicians? Dr Rademaker: The biggest help we can give our patients with psoriasis is to help them reduce their modifiable risk factors for infection, cancer risk, and cardiovascular disease, in particular encouraging weight reduction and smoking cessation. Routine infection screening is not appropriate but should be population and patient-risk specific. Before starting systemic therapy in our population — with the exception of acitretin — we would screen for tuberculosis, but not specifically for HIV or hepatitis B or C, unless there were specific patient reasons for doing so. We would not then routinely re-screen for tuberculosis but would consider doing so if the patient had potential exposure, such as travel or tuberculosis contact, or specific symptoms of concern developed. We have 2 competing concerns: the risk for a worse outcome if a serious infection such as tuberculosis or mycoplasma pneumonia develops while the patient is on systemic therapy, whether caused by the systemic therapy or incidental, vs the loss of control of psoriasis if systemic therapies are inappropriately stopped — or never started — because of an incidental infection. There is small case series level of evidence of a worse prognosis if tuberculosis develops while the patient is on systemic therapy, but the data on other infections are sketchy. Although it is very appropriate to stop systemic therapies while treating acute serious infection, we often delay restarting these therapies, which can result in major flares of the patient’s psoriasis. Dr Takeshita: First and foremost, it is important for clinicians to be aware that psoriasis and immunosuppressive therapies used to treat more severe disease are associated with an increased risk for infection. It is important to note that some of these infections are vaccine preventable, and it is especially notable that respiratory infections are among the most common serious infections, and herpes zoster is a particular risk among those with psoriasis who are receiving immunosuppressive therapy. Clinicians can, therefore, help to minimize infection risk in patients with psoriasis by recommending routine vaccinations, especially annual flu vaccines, the pneumonia vaccine series, and the new non-live shingles vaccine. Clinicians can refer to the Advisory Committee on Immunization Practices for specific recommended vaccination schedules. Clinicians should also caution their patients with psoriasis who are on immunosuppressive therapies to avoid live vaccines. Dermatology Advisor: What are remaining research needs in this area? Dr Rademaker: The interesting future research will focus on the role of the microbiome and innate immune systems in the etiology of psoriasis, its treatment, and the possible prevention of incidental infections. Dr Takeshita: Additional research is needed to further characterize the risk for various types of infection among patients with psoriasis, compare the risk for infection associated with psoriasis to that associated with other chronic inflammatory diseases, and to delineate the pathophysiologic mechanisms that contribute to the increased risk for infections associated with psoriasis and its therapies. 1. Takeshita J, Grewal S, Langan SM, et al. Psoriasis and comorbid diseases part I. Epidemiology. J Am Acad Dermatol. 2017;76(3):377-390. 2. Kalb RE, Fiorentino DF, Lebwohl MG, et al. Risk of serious infection with biologic and systemic treatment of psoriasis: results from the Psoriasis Longitudinal Assessment and Registry (PSOLAR). JAMA Dermatol. 2015;151(9):961-969. 3. Yiu ZZN, Smith CH, Ashcroft DM, et al; BADBIR Study Group. Risk of serious infection in patients with psoriasis receiving biologic therapies: a prospective cohort study from the British Association of Dermatologists Biologic Interventions Register (BADBIR). J Invest Dermatol. 2018;138(3):534-541. 5. Takeshita J, Shin DB, Ogdie A, Gelfand JM. Risk of serious infection, opportunistic infection, and herpes zoster among patients with psoriasis in the United Kingdom. J Invest Dermatol. 2018; 138(8):1726-1735.